I have a 16 yo indoor female cat who is infested again with fleas. I’ve been using Bio every month for 3 months washed everything possible flea combed bathed in Dawn almost weekly and treated indoor enviornment plus vacuumed. No good results. Cannot kill cycles or mature fleas!! My cat is overweight and may be diabetic. I’m afraid vet’s meds may be too toxic. Beside myself…not sure what to do…this cat is my life and don’t want to lose her!! Hi Carole and thank you for your question. For any medical concerns, we always recommend you consult your veterinarian. However, for non-emergency questions, you can contact Dr. Dym directly using our Ask the Vet form. We hope your kitty is flea-free soon! I have a10 month old Peekapoo puppy. I applied Advantix 2 which worked great on my previous dog. It worked great this time for about 2 weeks and now she is miserable with fleas. What can I do since the Advantix is a monthly treatment?? I bathed her in Dawn but that’s only good for a couple of days and I don’t want to dry out her skin by washing too often. Please help!! We recommend treating the environment with a room spray or fogger. In the meantime, ask your vet about using an oral product such as Capstar which will immediately kill any remaining adult fleas, although the effect will only last for 24 hours. I have a nearly seven year old cat named Genevieve. We got her from the shelter over 8 months ago and when we took her in for her first check up she had some hot spots on her skin. Vet didn’t see it as much of a problem, but we got recommended that we keep her on flea treatment in case it was a flea allergy and to change her food to grain free in case it was a food allergy. She is indoor only. For the past two months we have found fleas on her and have tried changing her flea meds (she was on Petarmor, then switched to Frontline, now switched to Advantage 2). Each time the fleas disappear for a while, i strip the covers off our couches as well as bed, spray advantage indoor home spray on nearly every surface, and yet still the fleas come back 5-6 days later. We have been careful to wait the full 7-30 days as the instructions on the box specify (Advantage says for infestations, a flea treatment every 7 days can be helpful, while Petarmor and Frontline said 30 days minimum between dosages). We gave her a flea bath between switching from Petarmor and Frontline, and that worked a while as well. Every two days I comb through her fur with a flea comb and drown the live fleas in a liquid dish detergent/water mix. Still, fleas. This case of fleas has aggravated her skin so much that she has many hot spots, she itches herself until she bleeds (we have since put a cone on her to prevent such damaging scratching and biting), and she has been losing fur. We took her to the vet before she started losing fur and the vet recommended the advantage spray for the home and advantage 2 flea treatment for cats over 9 lbs. Is there anything else further that I could be doing? Not sure how my apartment complex would respond to us flea bombing the place, but if need be I could do so. 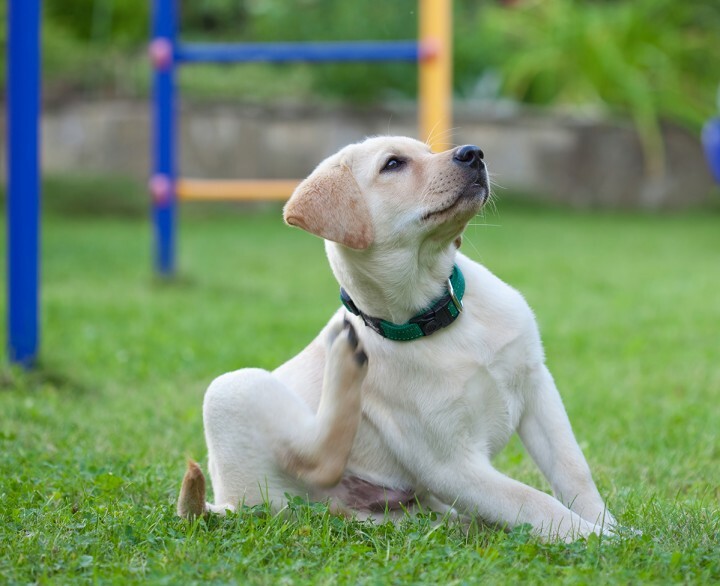 You have to be careful with oral flea and tick preventatives though-most oral products work by running through the bloodstream and ultimately it can lead to a dog needing to be bit by a flea or tick in order for it to die. This can lead to infections/disease transfer even if the flea/tick does die in the end (long story short: protects your home from fleas and ticks more than your pet). I typically use a collar (like Seresto) to keep my dog protected. You just have to be careful if the dog is going to be receiving baths/swimming a lot, as this reduces the lifespan of the collar. I have yet to see a tick on my dog when he has been wearing his Seresto collar, but I have picked many from pups on oral treatments like Nexgard. For a frame of reference, I live up in MN and go camping/hiking a lot where I can easily be picking 20-30 ticks off of myself in a day, and my dog is staying tick free with his collar (with just the oral medication, he would usually be crawling with them when we got back to our campsite). Carole Motsett- My vet told me not wash my pet in dawn soap as the soap will wash off the topical flea medication. Use a soap free shampoo. I have tried K-9 Advantage, Frontline Gold and now she is on Trifexis – NOTHING WORKS FOR THE FLEAS!!! Is there anything out there that truly does what the manufacturer claims it does?? ?